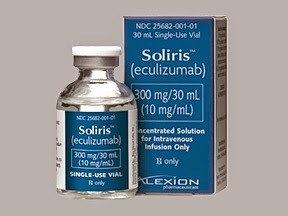 When I contacted Alexion Pharmaceuticals, the sole company in the world that manufactures Eculizumab, the only drug with which I can have a successful transplant, they said they had no plans to bring the drug to India. Their chief concern was India's weak IP protection laws. In effect, they were worried that a local company could easily reverse engineer the drug and sell it at a fraction of the price. I was quite surprised that Indian laws would allow that. For a while, I assumed that they were referring to the illegal drug market where the drug would be copied in highly questionable conditions and sold illegally. I was wrong. Indian patent laws allow reputed Indian manufacturers to reverse engineer drugs and sell them at a fraction of the price at which the original drug is sold by the company that actually invented the drug. I read up a little on this recently. This issue was in the news after two significant rulings - on Novartis' Gleevec and Bayer's Nexavar, both cancer drugs. The rulings rejected the requests of these companies to prevent Indian companies from selling reverse engineered versions of the drugs at a fraction of the cost at which the originals were being sold. There are a few things we must know. India used to provide only for process patents and not product patents. So, you could get a patent only for the way you produce a certain drug, not the drug itself. This changed in 2005, when due to India signing the WTO treaty required it to become TRIPS compliant which provided for product patents. However, some safeguards were provided which prevented MNCs from monopolising their products often to the detriment of the general public. It is often the interpretation of the safeguards that come up for litigation. For example, there is a provision called Compulsory License where the country can allow a company to manufacture a generic version of a patented drug without the consent of the patent holder and sell it in the country by paying a certain royalty to the patent holder. Under what circumstances this can be done and what is the royalty that would be paid are all not specified clearly. Look at all this from a big pharma company's point of view. They would believe that since they have the patent to the drug, no one must be allowed to sell it. In fact, the price at which Indian companies sell the drug is often a miniscule fraction of the manufacturer's price. Further, the cheaper version could also be exported to other countries and this could be disastrous for the patent holder! The pharma companies spend a lot of money on research and actually bringing the drug to the market. They believe that it is unfair to them to allow generic versions to be sold by someone else, at such low prices! Now, look at this from a patient's point of view. There is a drug that is available in the market. The drug could save his life. But is priced so high that he cannot afford it. Or it is priced so high, his insurance / government will not pay for it. He would say this is completely unfair! He would argue that in the case of life saving drugs, commercial exploitation must not be allowed. When someone else is able to produce the drug and sell it much lower prices, this should definitely be allowed! I know someone who works in the IP division of a firm who can throw more light on this, but the Novartis case was not about reverse engineering, per se. It was about Novartis trying to patent a different form of the same drug terming it as a 'higher efficiency' drug when its original patent was about to expire. It's a known patent-prolonging (or monopoly-prolonging, whichever way you see it) tactic amongst pharma companies. The Indian patent law doesn't term a different form of the same drug as a 'new creation' and doesn't give patents for those - that's why the application was rejected. I, for one, am with the Supreme Court's judgement here - for the benefit of not just people in India, but in other underdeveloped nations. We can discuss more offline! yes sohil is rigjt. issue was about evergreening a patent. One doubt here, what if the indian pharma companies, go outside india, reverse engineer the formula. Get it back to india and manufacture here? Where it is reverse engineered will not make a difference. It is the manufacturing and selling that will not be allowed.